Tent campers looking for a wilder camping experience with camp fires can pitch on our lower camping fields in sheltered glades, secret meadows or high on a bluff overlooking the estuary from 1 May until 30 September. 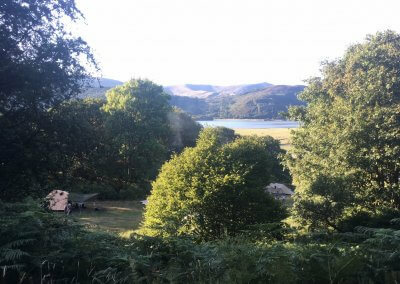 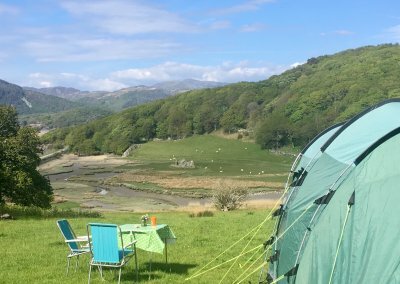 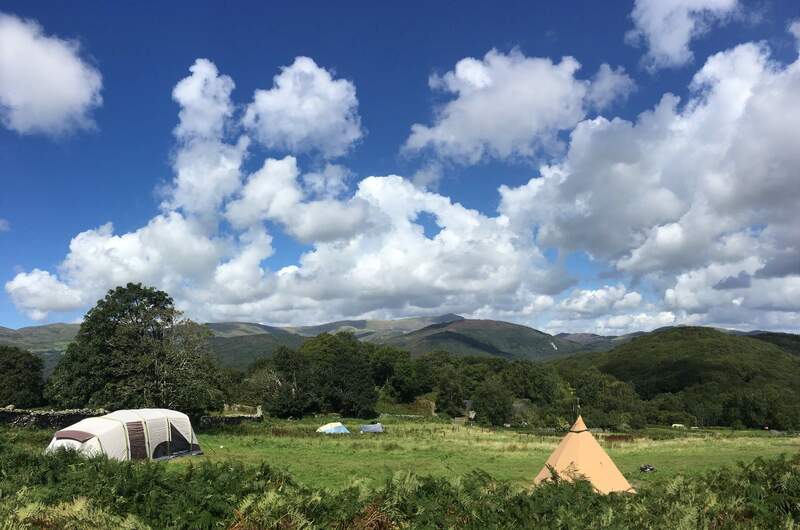 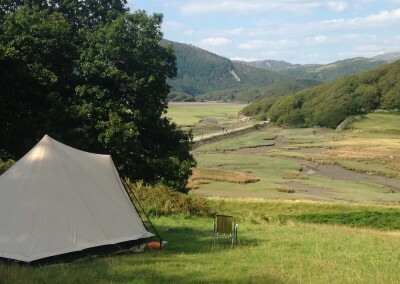 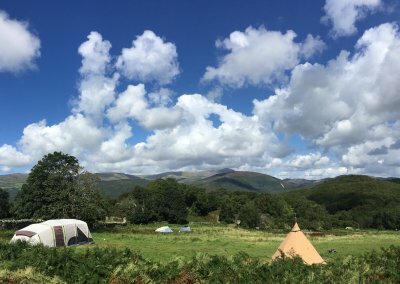 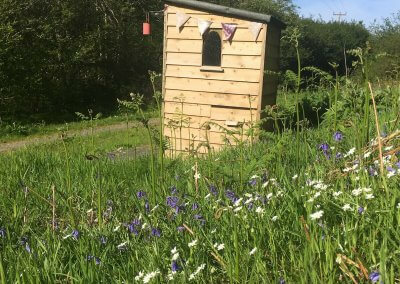 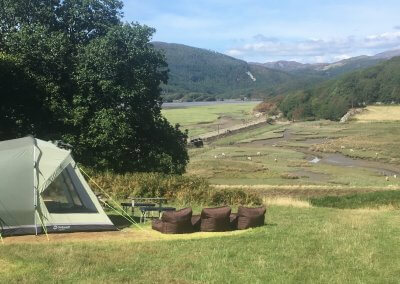 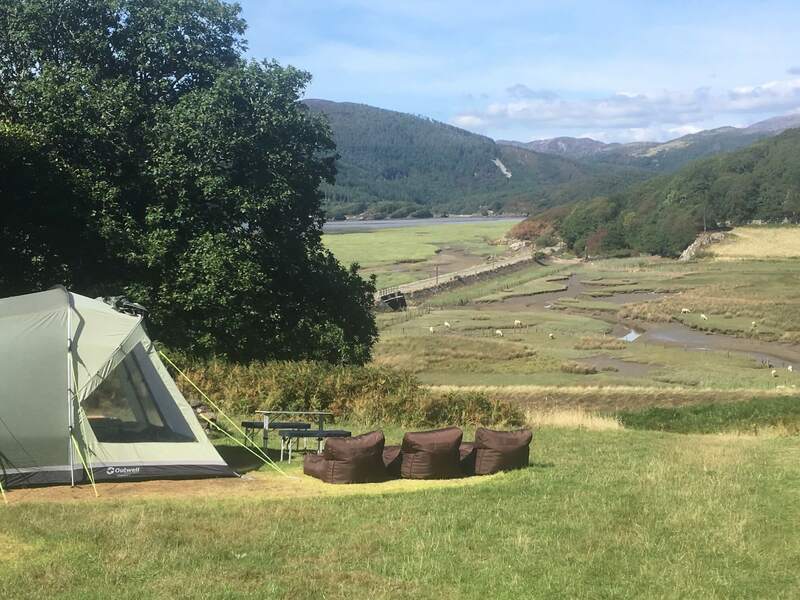 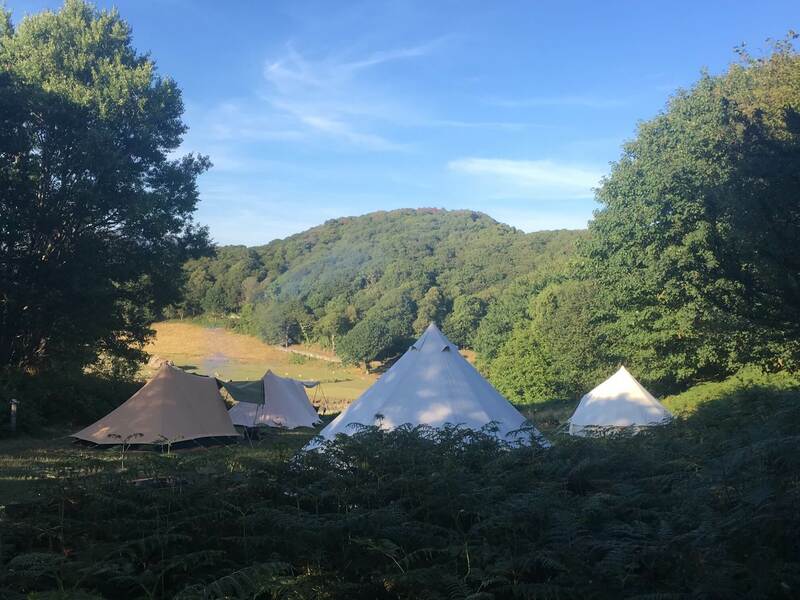 We are proud that our camp site is featured in the Cool Camping guides and has won a Green Snowdonia Award – we are in the top 3 places to camp in Wales in the most up to date edition of Cool Camping. 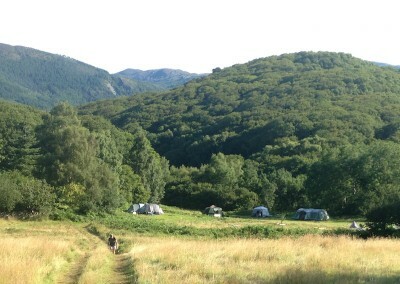 The lower camping fields are for tent campers looking for a back to nature camping experience. 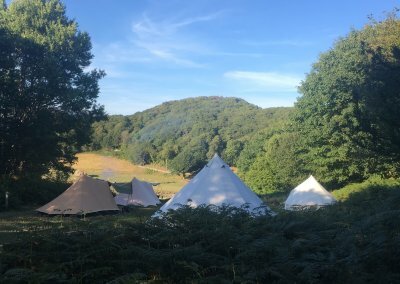 The 40 acres of meadows and wild woods are crossed by streams and dry stone walls so you are surrounded by unspoilt scenery and wildlife. 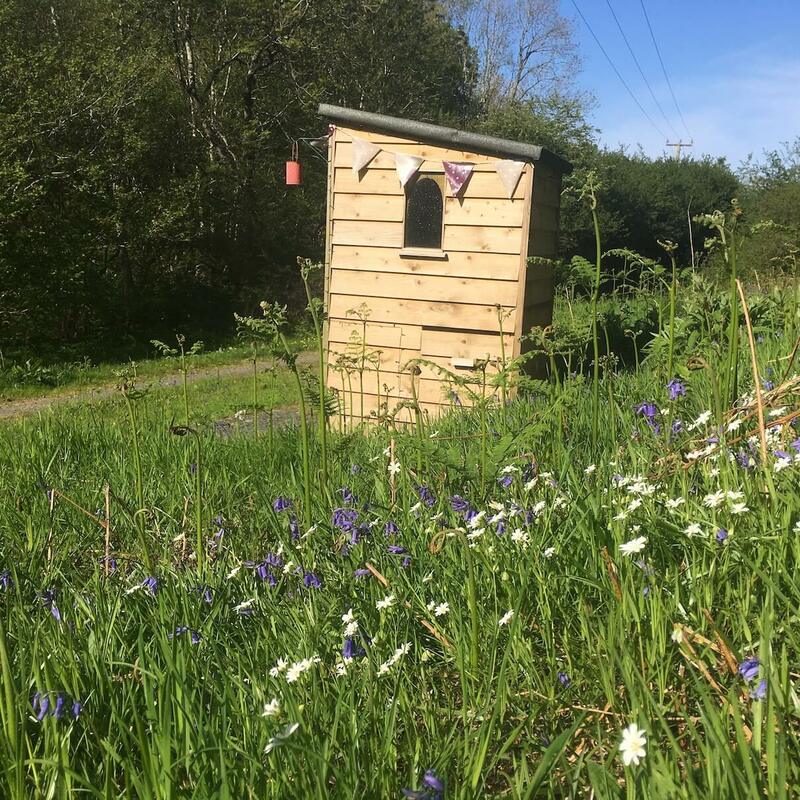 Your neighbours will be owls and woodpeckers! 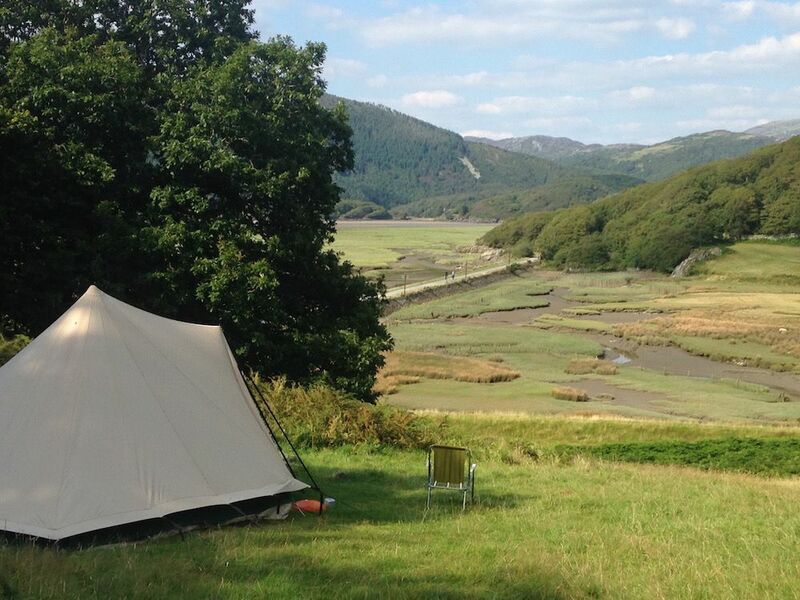 Pitches are spacious with a maximum of 18 tents permitted so there’s plenty of breathing space. 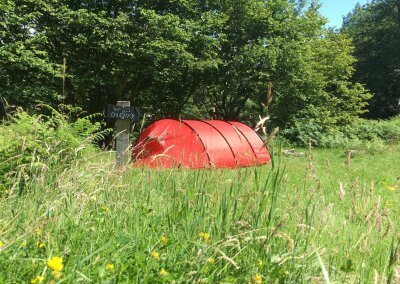 There are compost loos and a new shower trailer on the tent camping fields. 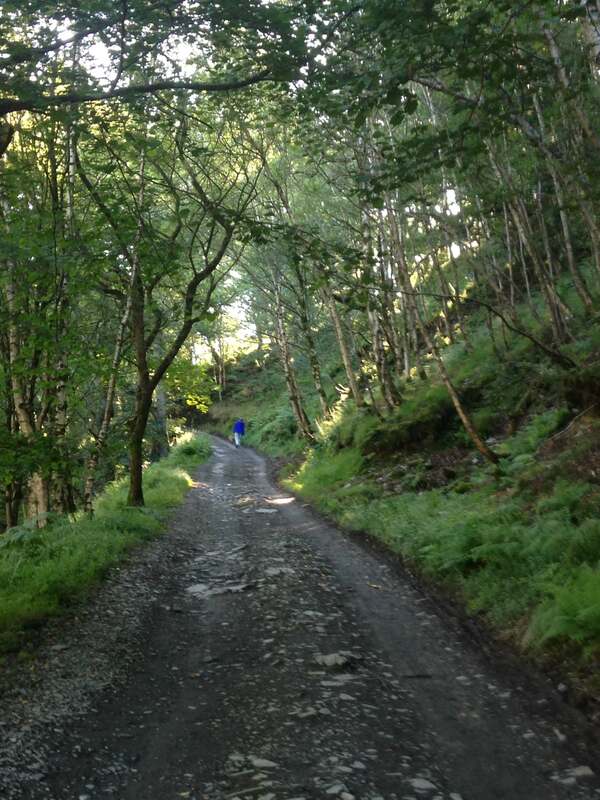 Vehicle access is strictly limited and the fields kept car-free – see below. 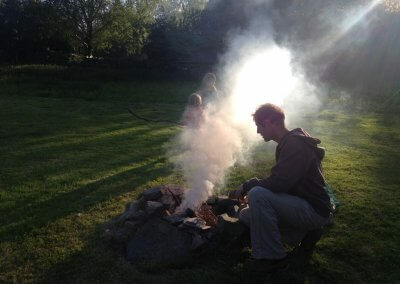 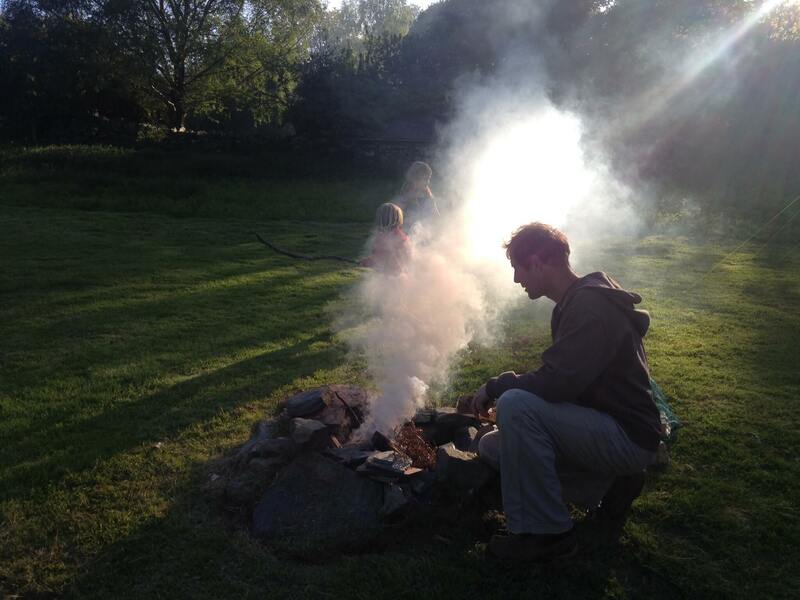 A great camping experience for grown ups with a spirit of adventure and families with older children. 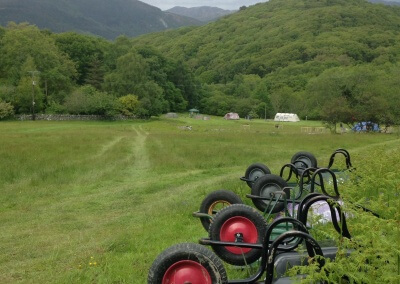 Vehicle access is via a steep track so the lower fields are not suitable for vans of any kind which are better suited to our touring site. 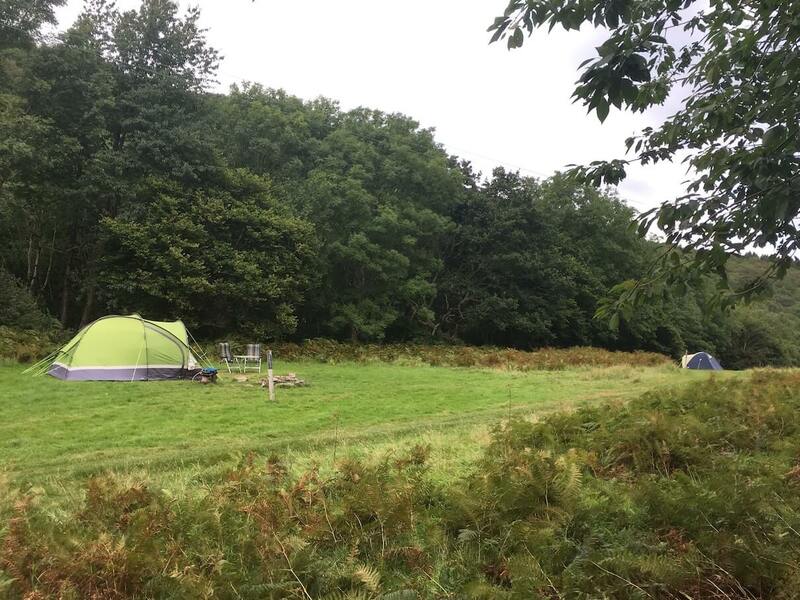 We have lots of space for tent camping but strictly limit the number of pitches and car access/parking to protect the tranquil environment. 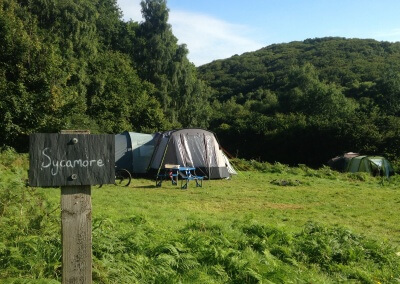 There’s a few pitches where you can park by your pitch. 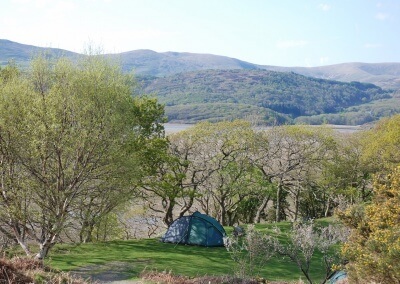 Most pitches are from 3 – 10 minutes walk from the car parking area. 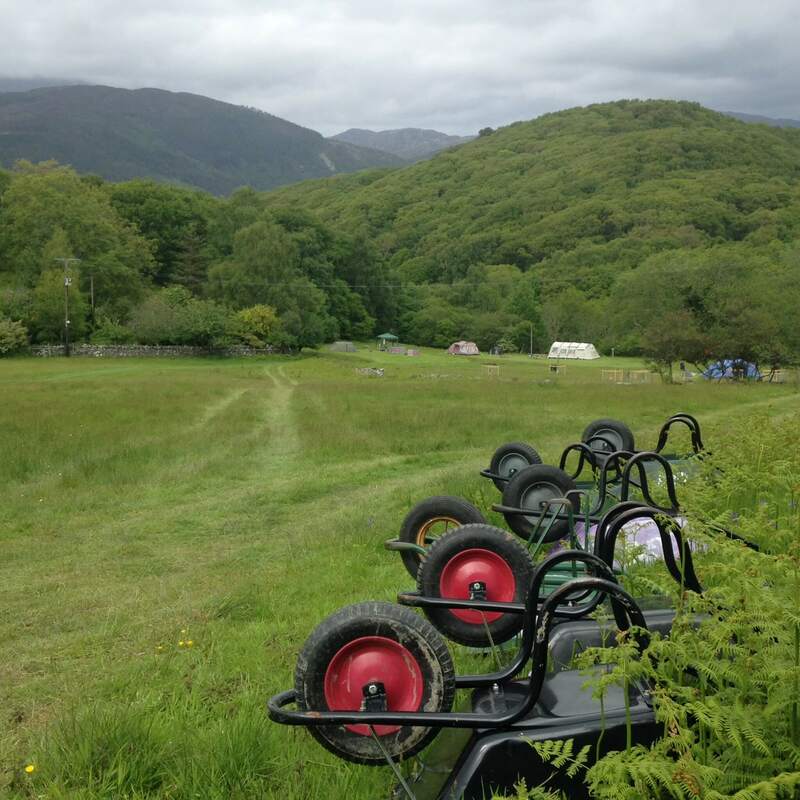 For famililies with lots of kit we try and offer a lift service for arrivals between 2 and 4pm. 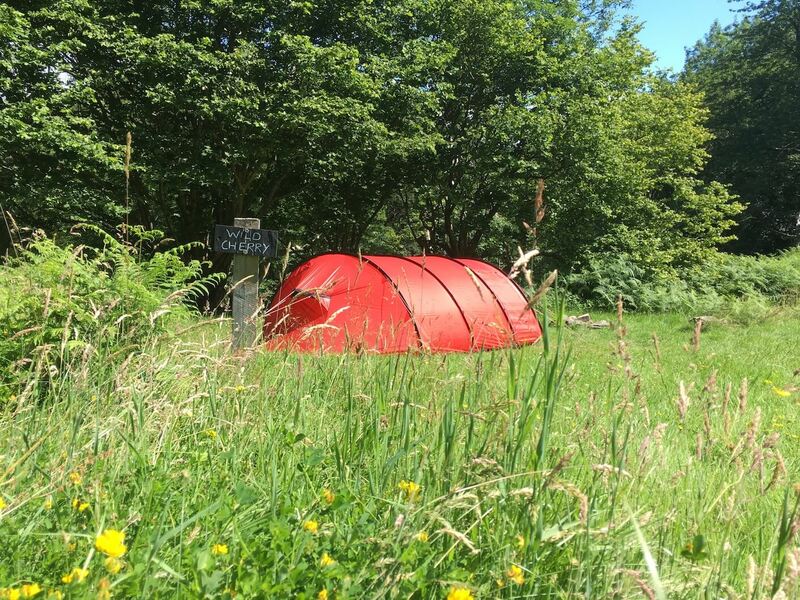 Outside of these times please be prepared to carry your kit to your pitch. 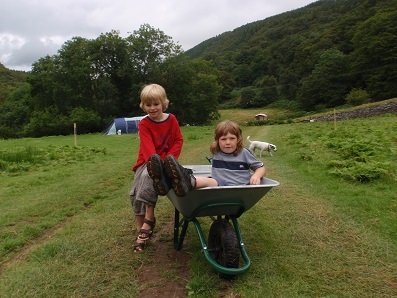 Wheelbarrows are provided to help! 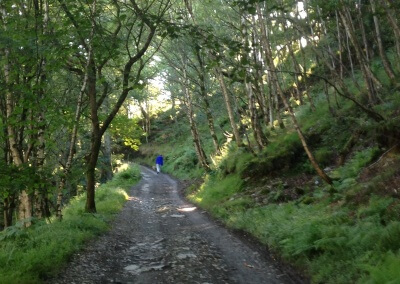 Access to the lower fields is for cars only (no vans) via a steep track. 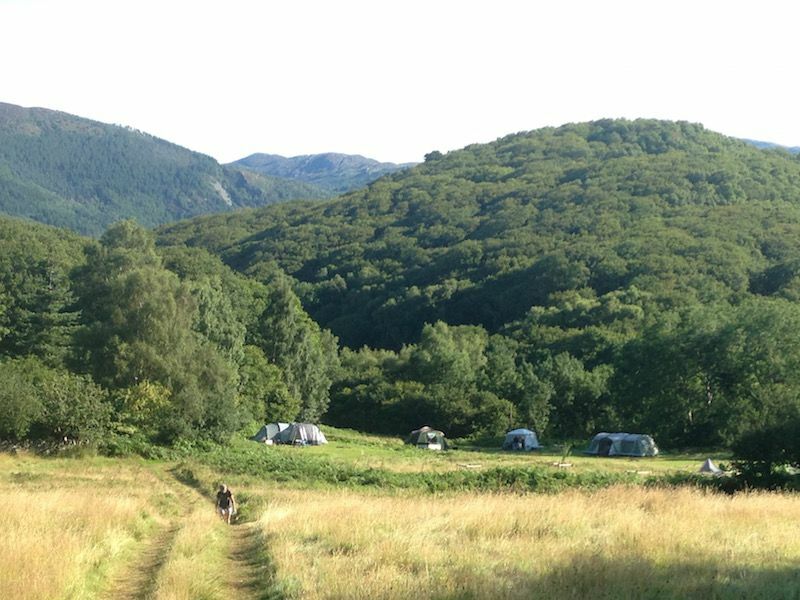 Please note that we do not accept new arrivals before 12 noon or after 6pm/dark, (whichever is earlier) unless by prior arrangement. 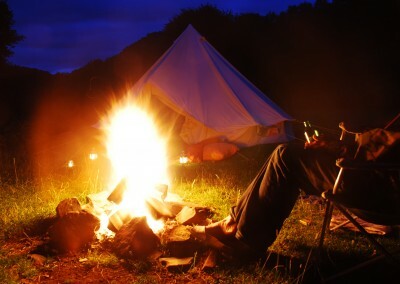 This is for the safety and peace and quiet of all campers. 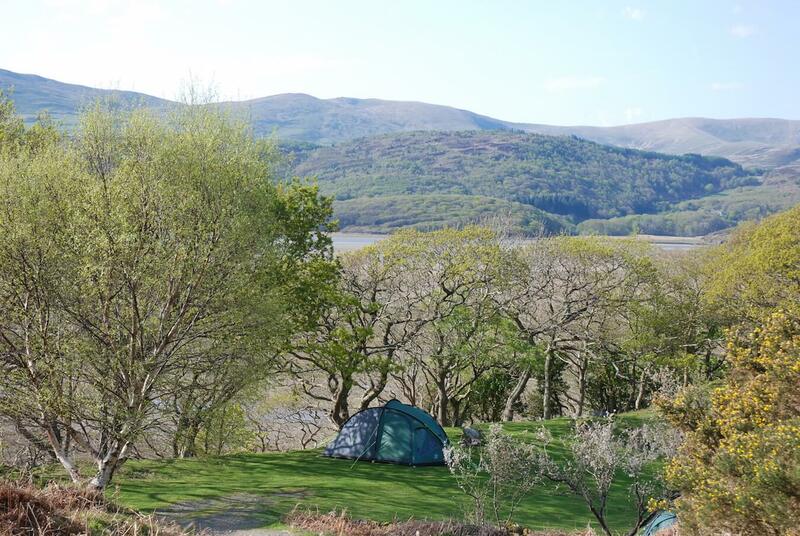 We have minimum booking requirements during peak season including 3 night stays on bank holidays. 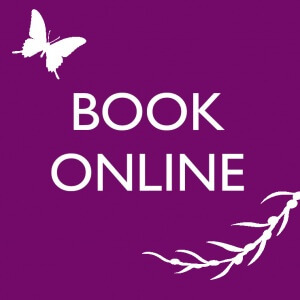 If you can’t book the dates you require online please get in touch and we will see if we can fit you in. Prices are based on one tent and up to 2 people sharing. 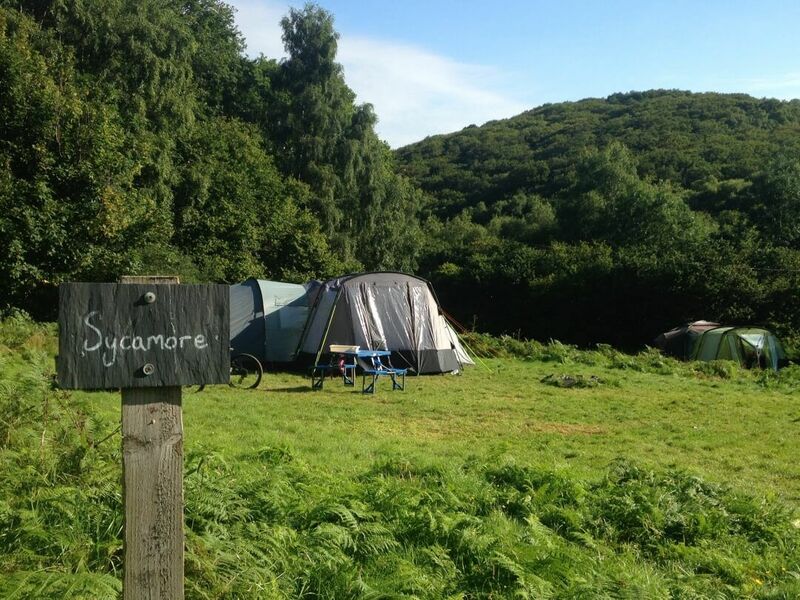 Strictly one tent per pitch. If you are a solo camper looking for a pitch last minute please contact us for the best deal we can offer. 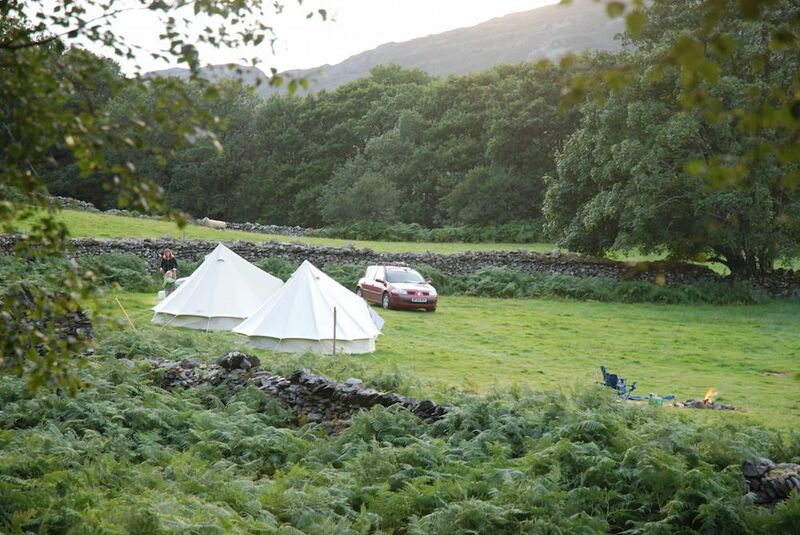 We regret car parking and pitches are strictly limited by planning restrictions. 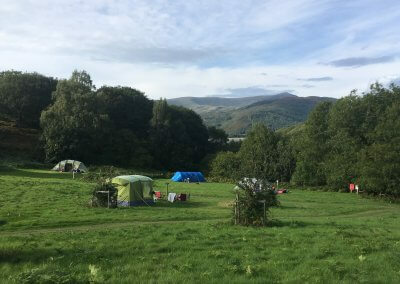 One car per pitch is allowed so any additional vehicles are strictly by prior arrangement and subject to availability charged at £30/night during peak times as we have to shut another pitch down to create a car parking space. 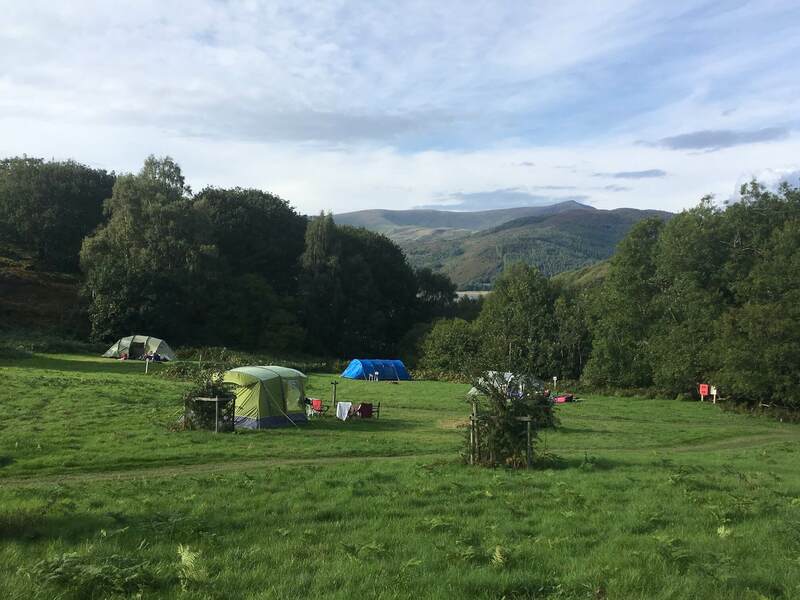 If you do have a problem please email or call us as soon as possible so we can re-let your pitch as another camper who may want it. 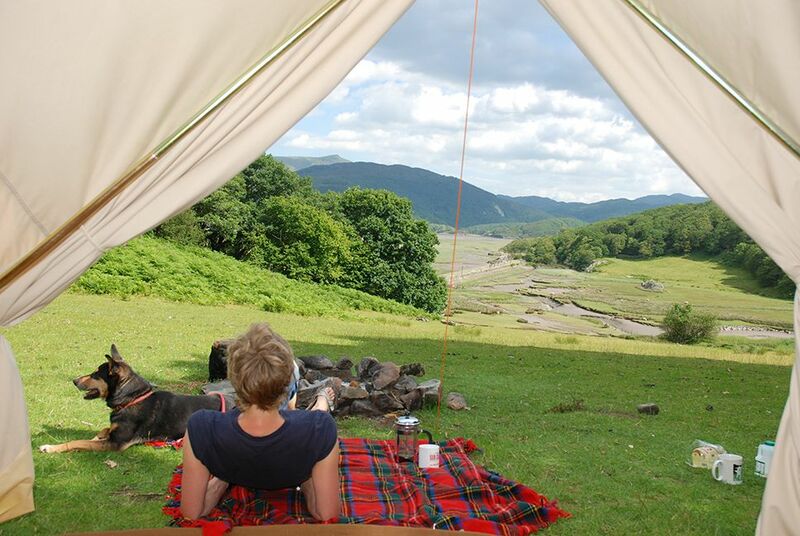 Deposit payments are non-refundable and non-transferable. 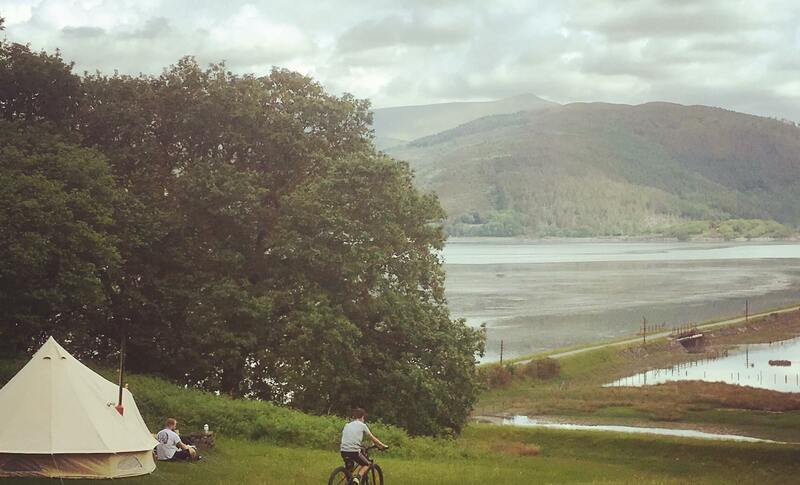 We recommend taking out travel insurance. You should let us know at the time of booking the size of tent you will bring to ensure your allocated pitch is large enough. 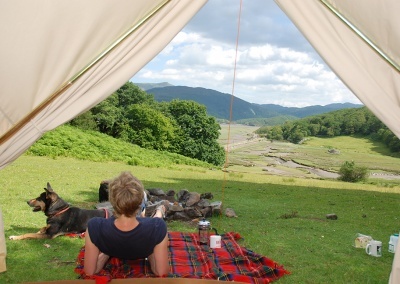 Gazebo and event shelters are by prior arrangement only as not all pitches are suitable. 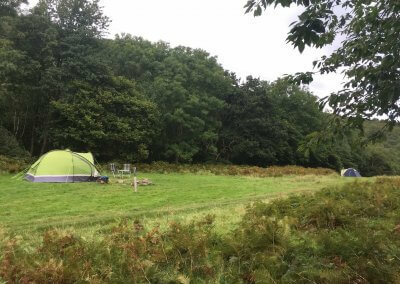 There is space for one car per pitch to park (strictly no van access to lower tent camping fields as track is too steep). 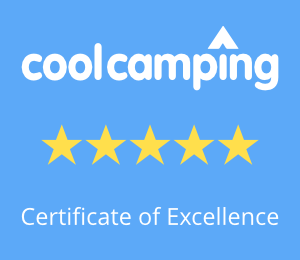 Should you subsequently change your requirements we will do our best to accommodate you but cannot guarantee to provide an appropriately sized pitch or parking space for additional cars. 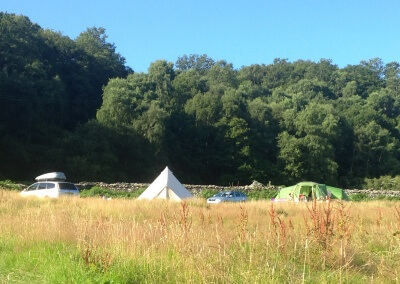 Strictly one tent per pitch only on lower fields. 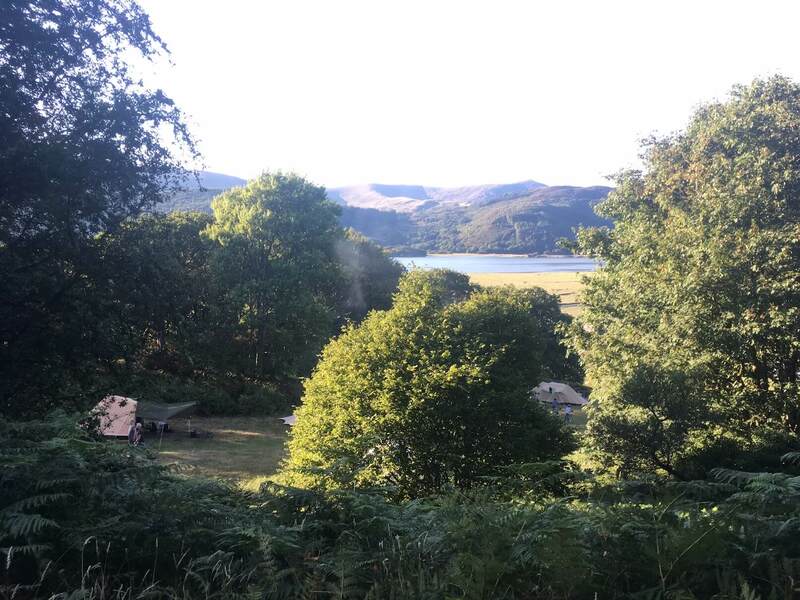 We regret our camping facilities are not accessible by wheelchair users and people with mobility issues may find the steep track to the estuary / facilities difficult. 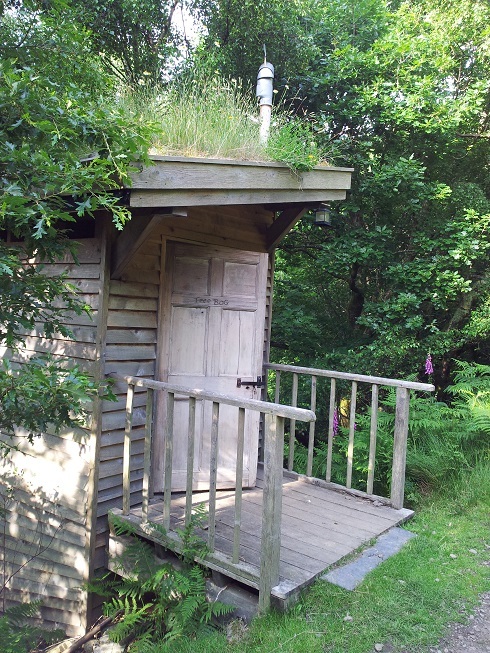 We have accessible accommodation in our B & B. 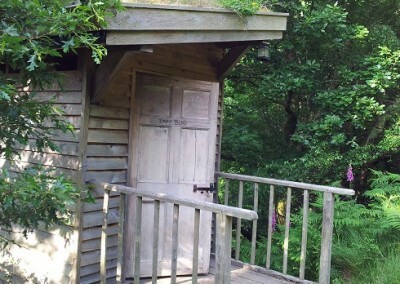 Our access statement is here.